Hire Me To Calculate Measurement Uncertainty. Download A Sample Uncertainty Budget Report. Uncertainty Budgets for ISO17025 Accreditation. Get accredited with reports that show how your uncertainty in measurement is calculated. An Uncertainty Budget is a statement of measurement uncertainty, the components of that measurement uncertainty, and their calculation and combination. Here are 4 great reasons to hire me. Get ISO/IEC 17025 Accreditation Faster. Eliminate Training Costs And Learning Curves. Stop Wasting Time Calculating Uncertainty. 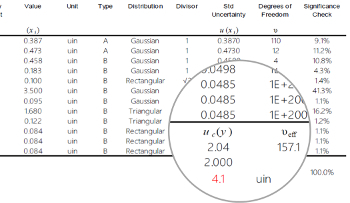 Get Templates For Future Uncertainty Calculations. Stop Stressing About Measurement Uncertainty. Just enter your information to get started! Want to Calculate Uncertainty Yourself? Try my measurement uncertainty calculator to create your own uncertainty budgets > Yes, I Want To Calculate My Own Uncertainty. 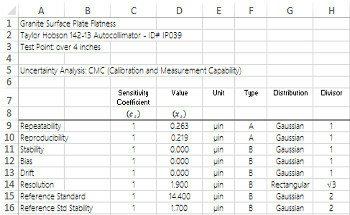 First, I collect your data: calibration reports, Type A data, and PT Test results. Next, I analyze your data and use an uncertainty budget to estimate measurement uncertainty. Then, I deliver the uncertainty budget to you in Adobe PDF report and MS Excel spreadsheet. See how your measurement uncertainty is calculated. Easily update your Scope of Accreditation. Copy & Paste. Update your own uncertainty budgets. All formulas included. 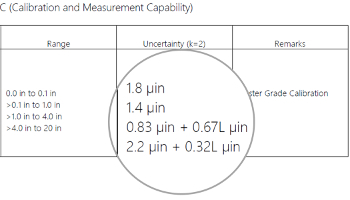 I calculate uncertainty for calibration and testing laboratories seeking ISO17025 accreditation. My uncertainty budgets are designed to be easy to read, share, and update. If you are struggling to prepare for your assessment or just need some advice, contact me to see what I can do for you. First, I collect your Type A and calibration history data. Next, I analyze that data to determine the magnitude of uncertainty. Then, I calculate the uncertainty and issue a report of my findings. Project pricing varies with the size and complexity of the project. Most uncertainty analysis cost $600 per CMC, but can range from $200 to $2,400 per CMC. The duration of a typical project varies by the size of the project. Most small projects are completed in a month. While larger project may take up to 3 to 6 months. Upon completion of the project, you will receive a report for each uncertainty analysis performed. Each report includes a summary with the CMCs for your scope of accreditation and the associated uncertainty budgets.